WTF Florida takes privacy very seriously, which is why we’ve taken the time to write this boring document. What kind of information do y’all collect? We collect everything that you provide us, such as your email address, name, and comments. You may choose to remain anonymous, or use a pseudonym. We may also collect your IP address and other User Information, which is standard practice on most websites. We will never share your IP address with anyone, except to comply with court orders or to cooperate with law enforcement agencies when appropriate. Whaddaya do with that information? Not much really. If you contact us through a form and want us to reply, we may use the information you provide, such as your email address or phone number, to contact you (duh). If you simply leave a comment on our site, we probably won’t contact you, but technically we can. If you sign up for our Newsletter, we will email you a newsletter, which you can unsubscribe from at any time. We will never sell your information. We will never send you spam. Sure. Just hit the Unsubscribe button on Newsletter emails. Don’t leave any details you don’t want to share with us when posting a comment. It’s that simple. Sure, but they don’t taste like anything. Like any self-respecting and modern website, we use “cookies.” They’re basically little chunks of data that are stored on your computer’s hard drive. We use them to make our site work. Some advertisement keeps following me around from site to site… why and how? We run ads to pay for our expensive web servers. We barely stay afloat, probably because this site is just for fun, and not for profit. We haven’t sold out (…yet, we’re still waiting on that fat check from the evil overlords at Sinclair Broadcasting… OK just kidding). Please don’t use an ad blocker on our site. Running ads is how we pay our bills and keep this site alive. If you really want to use an ad blocker, please buy a donation item from our website. How do I know your website’s safe? The little lock icon in the address bar should tell you something. It means we have a valid SSL certificate. We make a lot of jokes here, but our systems are solid. Hackers are blocked. Spam is deleted. Updates are made often. We take our website’s security very seriously. What do you do with the survey information? The data collected at surveys.wtfflorida.com will be kept anonymous. We will never sell your information. We will only collect the data you provide to us. Sometimes the data will be calculated to yield certain results elucidating the Floridaness of something, for example a “How Florida are you?” quiz. Sometimes we will ask questions about the site, how you like it, and changes you’d like to see. We collect that data to better serve you by understanding what y’all want. Again, we will never spam you. We will never sell your data. Surveys are mostly created to have fun, and to learn about our state. Sure, of course. Visit our Contact Page and ask away. WTF Florida operates at WTFFlorida.com. WTF Florida may be referred to throughout this document as “us”, “we”, or “our”. Users include anyone who uses our site (like you, right now). Users may be referred to as “you”. We (WTF Florida) may also be referred to as “you”, “your site”, and “y’all” in section headlines containing question marks, because the questions are formatted as if a user were asking us (WTF Florida) a direct question. These questions are underneath the “Questions About Our Site” section. In these headlines, “me” refers to the user. User Information that is collected includes your computer’s Internet Protocol (“IP”) address, browser type, browser version, the pages of our Site that you visit, the time and date of your visit, the time spent on those pages and other statistics. In addition, we may use third party services such as Google Analytics and Google AdSense that collect, monitor and analyze the cookie data on your computer. 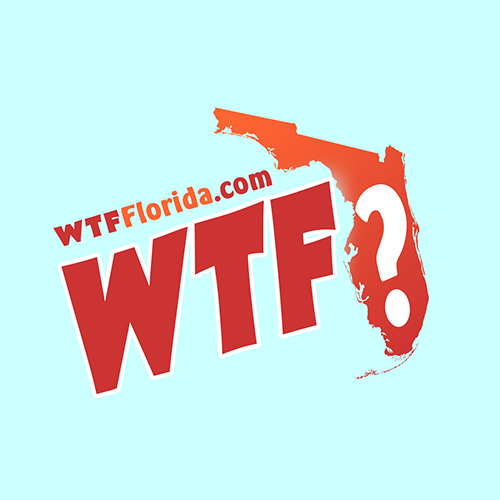 WTF Florida may monitor, record, collect and use for any lawful purpose information generated through your use of the website. We will never sell your information or purposely send you spam. We collect cookies. We run ads. Anything you send to us via contact forms on this site will be considered public information and may be posted on our site and made available to the public. The security of your Personal Information is important to us, but remember that no method of transmission over the Internet, or method of electronic storage, is 100% secure. While we strive to use commercially acceptable means to protect your Personal Information, we cannot guarantee its absolute security. We will never send you spam (links to viruses, click-bait articles, etc.) on purpose, but if our site gets compromised (hacked), we are not responsible for anything our attackers send. So far we have NEVER had a known security breach. Our site has a valid SSL certificate, and uses strong security measure to keep your data safe. Unlike The United States of America, European countries actually care about your privacy. Individuals located in certain countries, including the European Economic Area, have certain statutory rights in relation to their personal data, because of the GDPR. Subject to any exemptions provided by law, you may have the right to request access to User Information, as well as to seek to update, delete or correct this User Information. To the extent that WTF Florida’s processing of your User Information is subject to the EU General Data Protection Regulation, and to the extent of our technical capabilities, we will attempt to resolve any privacy concerns that you have. Please use the Contact Page to make any requests, or to ask any questions. Our staff resources are extremely limited, so please be patient.